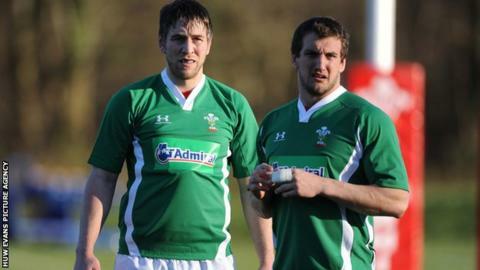 Skipper Ryan Jones has praised flanker Sam Warburton for the way he has handled losing the Wales captaincy. Jones has replaced Warburton, 24, who is on the bench, as captain for the Six Nations clash in Rome on Saturday. Jones will lead his country for the 31st time against Italy and set a new record as Wales captain. "Sam is his own man and he has to do it his own way and he has to face these challenges and come out the other side in his way," said Jones. The 31-year-old replaced the injured Warburton as captain and led Wales in the 16-6 victory over France in Paris which ended their eight-match losing streak in the Test arena. The Ospreys flanker formed a new-look Wales back row, along with Dragons number eight, Toby Faletau, and Ospreys open-side flanker, Justin Tipuric, and the trio have been given a vote of confidence by interim coach Rob Howley for the clash with Italy. Jones, who has won three Grand Slams with Wales in 2005, 2008 and 2012, has kept the job ahead of Wales' trip to the Stadio Olimpico. "It is amazing all the furore around this," said Jones. "Sam is a wonderful character, a complete professional and he has taken the challenge on the chin and he has still being functioning superbly within the group. "Sam is still club captain, if you like, and his role within hasn't changed." Jones knows all about the highs and lows of being feted and criticised and losing a role as Wales captain. He was appointed as skipper by Warren Gatland in 2008, was not selected for the 2009 Lions tour to South Africa and then taken off the job by the New Zealander after Wales drew 16-16 with Fiji at the Millennium Stadium in 2010. "We have spoken at length," said Jones. "I am a good friend of Sam's and I have a huge amount of respect for the kid as well. We have discussed different things, not just this week but over the last 12 or 18 months. "We have talked about various on-field situations and off the field and any experience I have got I am more than happy to pass on." While Jones feels for Warburton and his current plight, it is not lost on him that he sets a new record for a Wales captain when he leads the side out on Saturday afternoon. "These are things you treasure but you reflect on later in your career," said Jones. "At the moment, for me it is about making sure I am playing the best I can. "I am a huge Welsh rugby fan as well and i want this group of players and this team to be successful."